"Beware lest any man spoil you through philosophy and vain deceit, after the tradition of men, after the rudiments of the world, and not after Christ." Thank you for visiting the Living Springs Institute's Calendar Project! Why does this project exist? Because most of us are very familiar with all the holidays proclaimed by the church, but far too few have much awareness of the days God Himself gave to Israel in the Law. Due to these facts, this project's main goal was to create a daily planner which would teach you Biblical truths as you go about planning your everyday lives, and it has done that since 2009! However, another very important goal was to create a companion book in order to help people learn more about the Biblical calendar, feasts, and events listed in the planner, and that was accomplished in 2017! Moving forward from those two items, the project has the goal of creating further works which will go into more detail about each of the seven Biblical feasts as well as most of the other Biblical/Jewish events the calendar shows. Of course, the progress of each of these, along with how much is available now, is in the hands of The Lord. Thus, we encourage you to keep reading on down this page or use the links to the left in order to learn more about each item in this project. It is our prayer this project will be a help to your walk with The Lord, and that God will bless your journey in understanding more about the calendar He entrusted His chosen nation with in order to give us all something we might learn from. 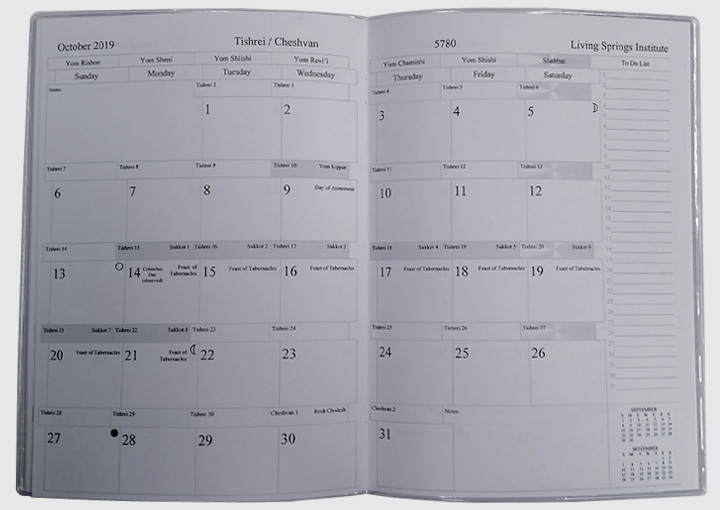 As mentioned above, the Living Springs Institute Daily Planner is intended to teach you Biblical truths as you go about planning your normal days, weeks, etc. How does it do this? By teaching you the Biblical calendar God gave to the children of Israel as you use a Gregorian calendar (which most all of us are familiar with) that also has the Biblical/Jewish calendar alongside. 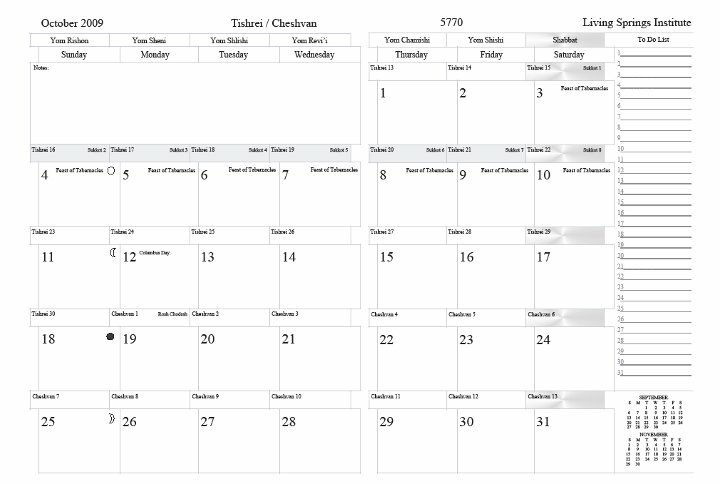 In doing this, the planner gives you a Biblical education while being useful in organizing a person's everyday life! 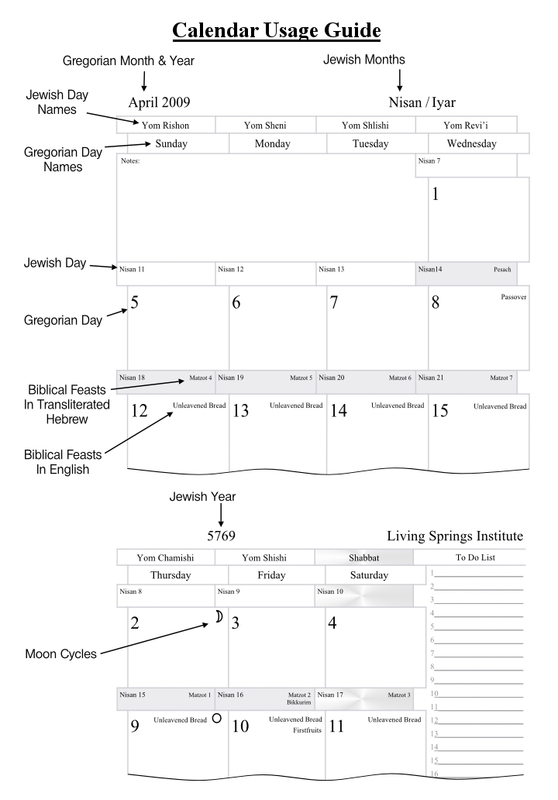 In the front of the planner, there is an introductory teaching which will help people understand some of the most basic elements about how God laid out Israel's calendar. It covers some of the differences between the Biblical calendar and the modern Jewish calendar of today. 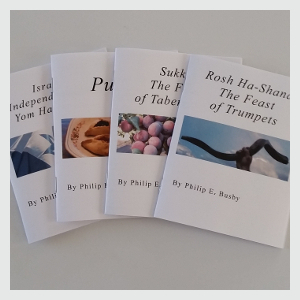 It also has a basic discussion on all seven of the Biblical feast days as well as Hanukkah and Purim. Most of this basic teaching concerning the feast days can be found in the "Other Books" section of this page. However, the reason I stress "basic teaching" in all this is that more extensive information is available in the book Counting The Days, which you can learn about below. Now, we understand that not everyone has a need for, or a desire to use a daily planning calendar. However, even if that is the case, it may be something you will find of interest just for the information it contains. 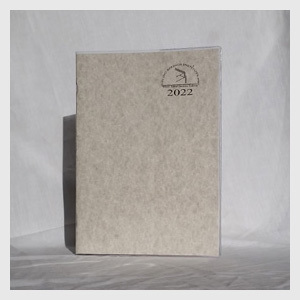 The planner is made available in two forms. First, you can order a printed version, free of charge, from the Institute's Resource Shop by clicking here. Second, the planner is also produced in an electronic PDF format. This means you can look at the entire calendar online and/or download a copy of it right now. All the information pertaining to the PDF version can be found by clicking here! To see all the pages of the calendar, visit the PDF Calendar Page and download a PDF version! 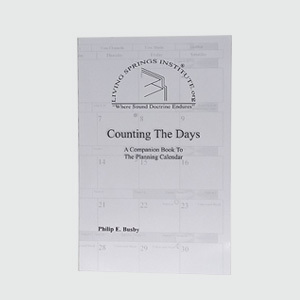 The companion book to Living Springs daily planner is titled Counting The Days! This book contains much more detailed teaching than what is in the front of the calendar itself. It also has a full year example of the planner in the back, making it a totally self contained work for anyone interested in learning the Biblical/Jewish calendar no matter if you want or don't want an actual planner for daily use. The reason you will see the term "Biblical/Jewish" used many times to describe the planner is because there is a difference. Counting The Days covers valuable information about how the Biblical calendar God gave to the children of Israel was set up, and why. It also explains the reason there is a Jewish calendar that differs somewhat, and goes over those differences so one can understand what God put in place as well as what Jews observe now. Beyond all that, Counting The Days contains teaching on each specific feast: their historical meaning, what they prophesy, which ones have been fulfilled, why they come when they do, and more. Now to be clear, it is not possible to cover all there is to know about the feasts and how they are observed in one book, at least not one small enough to carry around in a suitcase. There is also the truth that covering the way Jews, from different historical experiences, observe these feasts today just might be impossible. That aside, the truth we did not want the bulk of information that can be given about each feast to interrupt the initial learning of the calendar and the feasts is why other books/booklets are, Lord willing, a growing part of this project, and more information about each of those can be found below. To read an excerpt of Counting The Days click here. To see more pictures of the book, which are also larger than the one(s) on this page, along with further technical details about the book, you can visit the Institute's Resource Shop and click on the picture of the book there. If you would like, you can e-mail or write to us at any time to order this book, but visiting the Resource Shop is also the best way to order your free copy of Counting The Days! Below you will find the basic teaching for each feast covered on the calendar. As mentioned above, it is part of the goals for this project to produce an individual book/booklet for each of them. However, there may also be a page on this website that gives greater information. Thus, the writing for each feast below should tell if a book/booklet for that particular feast is available, and if there is a page on this site for more information - the title of the feast should be a link to that page. The book/booklet for this feast is not yet available. However, more teaching is available by clicking on the title of the feast above, and a list of any other articles that talk about this feast can be found on our Subjects Page. The book/booklet for this feast is not yet available. However, a list of any other articles that talk about this feast can be found on our Subjects Page. Rosh Ha-Shana (Feast of Trumpets) is held on the first day of the seventh month. It is a day of blowing trumpets. Moses was ordered to make two silver trumpets which would be used to assemble the congregation of Israel to the door of the tabernacle. (Num. 10:1-10) In ancient times, trumpets were sounded for many reasons. Sometimes it was to celebrate a joyous occasion - such as a wedding. Sometimes, it was to warn of a coming invasion; and sometimes, it was to announce the coming of a great king! Today, this feast is called Rosh Ha-Shana which means "Head of the Year," because this day is the modern Jewish new year. In many ways, this is very appropriate, because this feast foreshadows the Second Coming of The Messiah to this earth, which will truly be a new beginning for Israel and all the world. When this feast is fulfilled, all will realize Jesus is truly The Messiah and King! The Bible records Jesus will return with a shout, with the voice of the archangel, and with the trumpet of God. (I Thes. 4:16-18) This event will mean different things to different people around the world, depending on how they feel about The Messiah. For those who are against Him, these trumpets will be an alarm; but for those who have believed on Him, these trumpets are a sound of joy. However, no matter how you feel, to all it will be the announcement of the returning King, Who is King of Kings and Lord of all, and He will gather His own unto Himself! The solemn assembly held the day after the seventh day of the Feast of Tabernacles is the end of the God commanded feast days for the year. However, we should consider two other Jewish feasts which, due to history, appear on their calendar. These two feasts may not have been given directly in the Law, but they too mark prophesied historic events and/or truths. Purim is a two day feast held on the fourteenth and fifteenth of the Jewish month preceding Biblical New Year. Purim means "lots," as in casting lots. It remembers the story told in the Book of Esther, which took place during the reign of the Medes and Persians, where an evil man named Haman had received permission from the king to kill all the Jews in the kingdom. (Esth. 3:1-11) However, God had already placed Esther in the queen's position. Esther risked her life by revealing to the king she was a Jew and asking for the life of her people to be spared. The king not only spared the life of the Jews, but in doing so, gave them the chance to destroy those who hated them! This incident proved God was still with His people, and would not allow them to be destroyed. Holocaust Remembrance Day (Yom Ha-Shoah) is the day set aside for remembering the victims of the Holocaust, and was established in 1959 as an official observance in the state of Israel. The Holocaust is a very important event in history to remember, not only because it was the largest most well organized genocide the world has seen, but because it was a direct attempt to wipe from the face of the earth the chosen nation God committed His oracles to. In the Holocaust we clearly see man's desire to dispose of the things of God in this world. While the deeper horrors of the Holocaust were not widely known until after it was over, the general fact thousands upon thousands of Jews were being exterminated, took place in full view of world leaders! This makes the Holocaust an astonishing event as we see none of the nations of the world acted to stop it. It would only be the truth that much of the world eventually came to a desire to stop the advance of the Nazis regime that the Holocaust would come to an end as a part of the overall collapse of that regime. By then, the lives of over six million Jews, along with many others, had been taken. As believers in The One True God this should be something we are never willing to accept happening to any group of people, much less God's chosen nation. As the world once stood back and did nothing, Holocaust Remembrance Day gives us a time to build determination in our hearts and minds that we will educate future generations about how and why such an event can come about, and literally stand with God's chosen nation in saying, Never Again! Israel's Independence Day (Yom Ha-Atzma'ut) is the observance of the largest single event prophesied as something that would take place before the return of The Messiah. That event is, of course, the establishment of the modern state of Israel! Israel's Independence Day is also preceded by Yom Hazikaron, which is a memorial day for Israel's fallen soldiers and victims of terrorism. All this has direct ties to the Holocaust, as in May of 1945, Nazi Germany collapsed, and the death camps which were carrying out the Holocaust ceased to operate, but several hundred thousand Jewish survivors were unable or, for obvious reasons, unwilling to return to what they had considered their home countries. Still, the world resisted allowing the Jews to return to the land God promised Abraham they were to possess! However, in November of 1947, the General Assembly of the United Nations decided to divide what they called "Palestine" into two states, one for the Jewish people and one for the Arabs. Jews would celebrate in the streets, but the Arabs rejected the plan. While the world for the most part stood back and did nothing once again, the Jews fought to defend the land of Israel and its people, both Jewish and Arab, from the neighboring states which attacked them. The Jews won the War for Independence, and on May 14, of 1948, the State of Israel was declared along with unrestricted Jewish immigration into it! For many centuries, Jews have been persecuted in foreign lands, but now when this kind of persecution takes place, more and more the land of Israel is the destination of choice. God is rebuilding the nation of Israel as the Jews are once again returning to their land in great numbers. This is what makes Israel's Independence Day an exciting event to recognize! Jerusalem Day (Yom Yerushalayim) celebrates the reunification of the city of Jerusalem, which took place in 1967. On May 12, 1968, the Israeli government proclaimed the twenty-eighth of Iyar (which is the day June 7 corresponded to on the Jewish calendar in 1967) "Yom Yerushalayim," and on March 23, 1998, a law was passed making it a national holiday in Israel! Jerusalem is important because as God brought His chosen nation out of Egypt to the promised land, He said He would one day pick a spot in the land to place His name. (Deut. 12:9-14) During the time of David we see God appointing that place, and it would be the city of Salem (Jerusalem), which is adjacent to the mount where God had told Abraham to sacrifice Isaac. By the time of King David, this city was still held by Jebusites, but David would take it from them. (II Sam. 5:1-10) By God's direction, David's son Solomon would build a beautiful temple there to replace the tabernacle. Sadly, the city would not continue to be administered with purity as future kings of the nation would fail to do as they were instructed by God. This would lead to the destruction of Jerusalem, and the city would lay in ruin during the absence of the Israelites. (II Chron. 36:14-21) However, this left the door open for the Jews to rebuild the city and temple as they returned from captivity. Jerusalem and the nation would see many hard days between then and the coming of The Messiah. It would also be in more jeopardy than many realized by the time Jesus came, as not many decades after Jesus left this world the city and temple were again lost in the year 70 A.D. Jews being unwelcome in the city became a reality, and Jerusalem would remain out of their control for many generations after this! Jerusalem was often fought back and forth over by religious powers through the centuries leading up to the reestablishment of the nation of Israel. This is why Jerusalem was not officially made a part of the section of land designated as being given to the Jews or Arabs according to the UN's partition plan. Instead, Jerusalem was to be designated an international city/area. However, by the end of Israel's war for independence Israel controlled the western half, and Jordan claimed the eastern half as part of their annexing the entire West Bank. Just about two decades after Israel's independence, Arab states surrounding Israel once again brought war against the nation. As these forces poised for an all-out assault, Israel launched a preemptive attack, and just six days after it had begun, the war known to history as the Six-Day War was over! Israel had defeated three Arab military forces and proved they could defend their interests in the region. However, the most important thing to come of the war was due to Israel's concern over Jerusalem's vulnerability. While Israel had no plans to take any territories controlled by Jordan, it became clear the IDF would have to take control of the Old City of East Jerusalem as attacks on western Jerusalem intensified. On June 7th the IDF accomplished this goal, and the Israeli commander ordered his troops to dig in and hold it. If any city ever belonged in Jewish hands it was/is Jerusalem, and this is why it has continued to be a major factor throughout Jewish and world history. With the city now reunited under the control of God's chosen nation, we celebrate Jerusalem Day. This day is certainly a day for us to pray for the peace of Jerusalem, but it is also a particularly good time to stop and consider all that has come to pass concerning what Jesus said would happen before He returns. Israel is a nation once again; the Jews are returning to their land in great numbers every year; and Jerusalem is, once again, in the hands of the Jews! The book/booklet for this feast is not yet available. However, a list of any other articles that talk about Jerusalem can be found on our Subjects Page. We know your time is extremely valuable, and that is the very reason we are producing an educational product such as the daily planner. I want to thank all of you just for taking the time to read this information. We appreciate you taking part in this ministry, and pray you will continue to grow daily in the grace and knowledge of our Lord Jesus Christ! Get Living Springs Institute's Bible studies, Q&As, and more delivered to your inbox or mailbox. We're a 501(c)3 non-profit, and your donation is tax deductible! Join us on Twitter, Facebook, and Instagram.